We are experienced in painting, repairing and installing decorative trim on all all kinds of ceilings in both residential and commercial buildings. If you plan on selling your home, by painting it you can add value and make a great first impression, which is essential when selling your home. We also install wallpaper in many types of rooms, and are pleased to offer free color consultation; Childrens rooms Kitchens Utility rooms Bathrooms Bedrooms Living rooms Dining rooms Stairways Hallways Basements Studies Libraries Offices To achieve outstanding quality, preparation is most important. 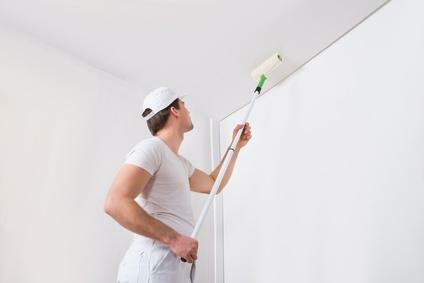 Prior to painting we repair all wall and ceiling surfaces; Drywall cracks are are usually taped with a fiberglass mesh and then finished with several coats of joint compound. Cracks in plaster are opened up enough to allow new plaster to be forced into the gaps. Holes in drywall left by, electrical repairs, plumbing repairs, water damage, etc.. are repaired by plastering, and or replacement of the drywall.